Did I mention that I am a huge animal lover? So I guess it comes natural to me that I create tons of animal cards, especially dogs. As I live with my two fur babies Maya and Sudo, I guess it is no surprise. Fitting for the Catch the Bug challenge "All creatures". 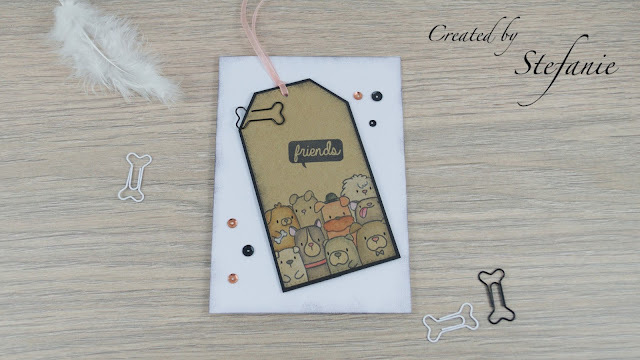 For this card, I used the stamp set from Mama Elephant "The Doog's Woof" to create a tag out of kraft paper. I did a quick colouring with my Derwent pencil, to add some colour to the little guys. The sentiment is from the Kaisercraft "Polaroid" set. This tag is perfect for the "add a tag" challenge from Crafty Calendar. After a bit of distressing the edges with some black ink, I added the cute bone paper clip I just found in my drawer. Can't even remember where I got these from. But too cute. The sequins are black and copper. Just the little ribbon is a bit girly. As I do not know yet which friend will get this card, I wanted the option to change the colour and the possibility to give it to male or female friends as well. Voilá, another card done and suitable for the Clean and Simple on Sunday challenge "celebration with sequins". 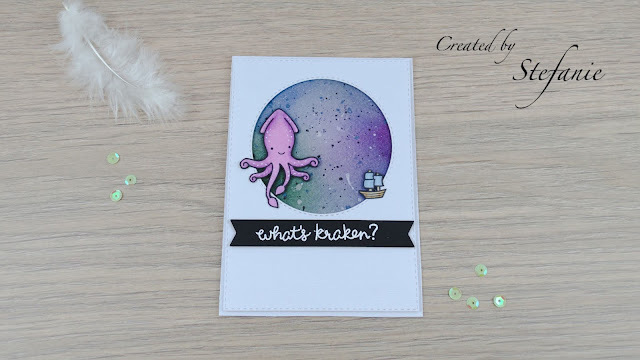 Gorgeous card, love the tag and image. Stefanie, this is so adorable. LOVE the bone paperclip. Thanks for joining in the Catch the Bug Natures Wonders Challenge, Lisa Lynn DT. Your card /tag is so cute. I am loving those Mama Elephant dogs.. I need to get this stamp. I am so glad you shared your card at Catch the bug.